A video surfaced on several social media sites Sunday showing three or four San Antonio police officers forcibly detaining a 14-year-old girl while her mother screams in the background, attempting to help her. The brief video, made by a bystander, caught the attention of several local activists who are outraged by the officers’ actions, saying one used excessive force. The girl, an eighth-grader who the San Antonio Express-News is not identifying because she’s a minor, was arrested Saturday night on a criminal charge of assaulting a public servant, according to one of her lawyers. She remained in the Bexar County Juvenile Detention Center until Monday afternoon, when she was released by Judge Arcelia Trevino. 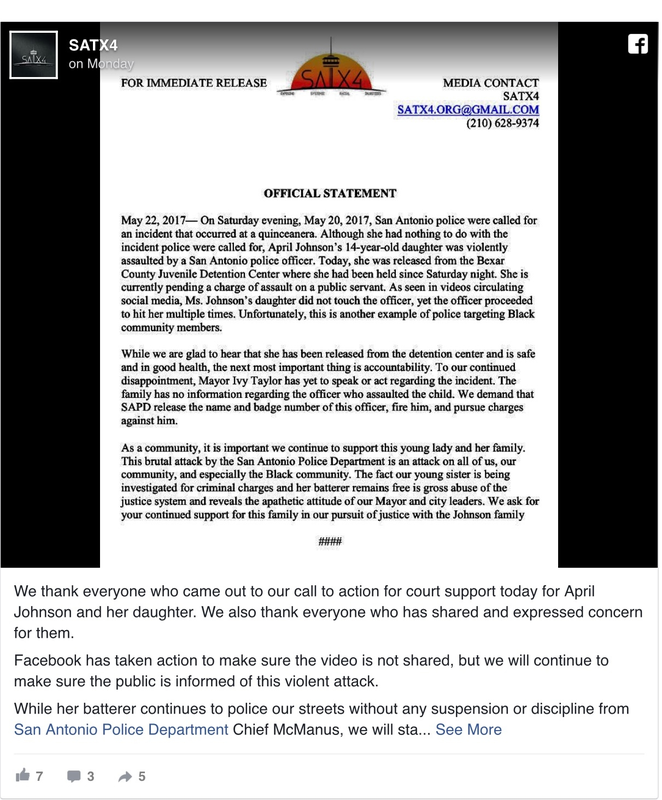 Artessia House, one of the girl’s lawyers, said her client, an honor-roll student with no history of violence, did not assault the officer. House said one officer can be seen in the video “clear as day” striking the girl. The 39-second video is blurry, unsteady and shot from a distance at night. One officer can be seen lunging toward the girl, her head suddenly whips around and she falls backward. The video has been removed from Facebook, but it remains on YouTube and Twitter. A spokeswoman for the San Antonio Police Department said officers were called about 11 p.m. to the Crown Palace Event Center on Walzem Road on the Northeast Side about an assault. Initially, the report was about two men fighting at a quinceañera, which the girl and the mother were attending, according to House. The fight moved to the parking lot. In the video, one officer can be seen talking to two men in the parking lot. Then the camera pans to the left and an officer roughly grabs the girl, wearing a purple dress. More officers jump in and for nine seconds attempt to restrain the girl, grabbing at her from behind as the whole group stumbles across the pavement. They eventually move behind a vehicle, out of view. 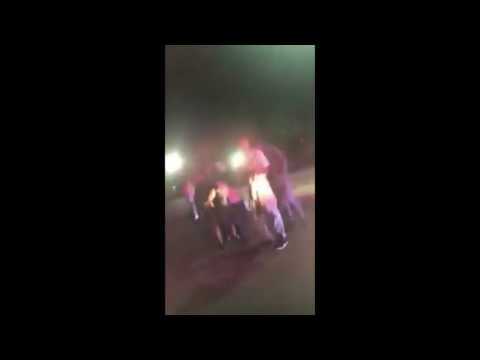 The girl’s mother, in a white dress, can be seen trying to get to her daughter and pleading with officers to stop while she is also restrained. Bexar County District Attorney Nico LaHood can determine whether to proceed with the case or drop it. The office did not immediately respond. About a dozen local activists and family members attended the court hearing Monday, decrying the officers’ actions while offering support to the girl and her mother as they addressed the judge. After the hearing, Taj Matthews, executive director of the Claude & ZerNona Black Development Leadership Foundation, said he wants to know how the investigation will be handled. “There’s no way you can justify this officer hitting this girl in the face,” he said. Police officers are archaic. The entire role of a police officer is not only outdated, it's detrimental. This is really easy to see, too. Consider the tools at an officer's disposal: weapons (baton, taser, gun, pepper spray), fines & tickets, Arrest and detainment. None of these are capable of actually helping communities in meaningful ways: they are all forms of punishment, and that's all police can do. It's ridiculous to think that police can actually engage with communities in meaningful ways when right from the outset we see that their tools of engagement are all violent and punitive in nature. When the only tool at your disposal is violence it's no wonder police are constantly assaulting old ladies and children.